With Yesware Campaigns, you can create personalized multi-touch emails that send on their own. All you need to do is drop in recipients and watch them engage. Campaigns will take care of any automated touches you schedule in advance and then prioritize the tasks that require your attention, bubbling them up as “To-Do” items in the Yesware Sidebar when it’s time for you to take action. 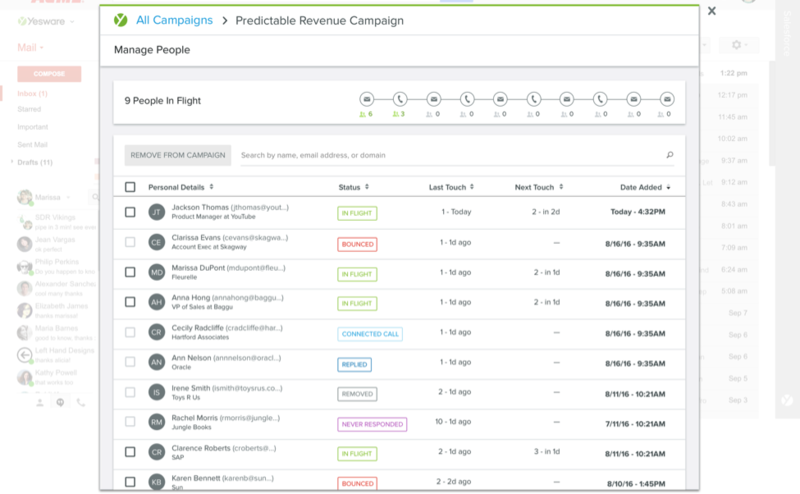 Unlike sales development tools that require reps to switch between platforms and disrupt your team’s workflow, Campaigns works right from your inbox and integrates with Salesforce.com to create personalized, multi-channel campaign sequences, quickly transforming sales development teams into focused and hyper-productive revenue machines. Campaigns is currently available on Gmail and Outlook on our Premium and Enterprise plans. Campaigns makes it quick and easy to tie a list of recipients to your email campaign. Import from a CSV file, Salesforce, or by manually adding recipients. 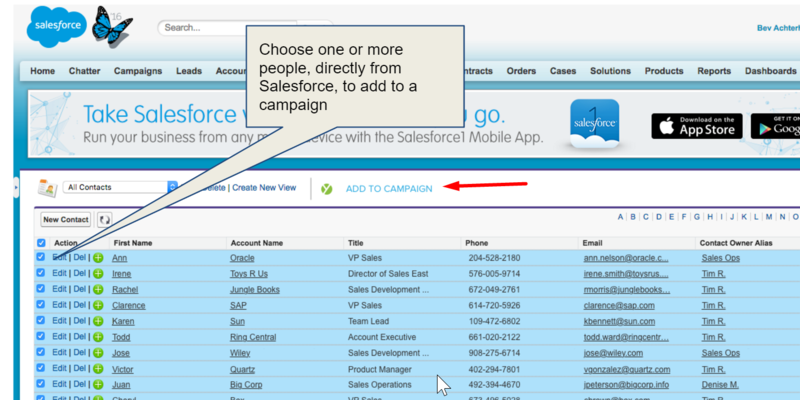 Reps or managers can also add users to their campaigns directly from within Salesforce.com using the “Add to Campaign” button. Send customized messaging by choosing the touch time, timing, and the number of touches for your Campaign. By taking a multi-channel approach and incorporating Yesware for Gmail LinkedIn Sales Navigator touches, you’ll be able to make genuine connections in no time. We’ll notify you to complete your manual tasks in the sidebar (available on both Gmail and Outlook). You won’t have to rely on your memory and can focus your time elsewhere. By default, Campaigns will show prospects in the order they are retrieved based on date the prospect was created. You’ll also be able to see the total number of tasks listed at the top of the Campaigns Tab on the sidebar. Done: Marks the item as completed. Snooze: Lets you save the task for later, removing it from the list until the appropriate time. Skip This Touch: Skips this step for this prospect and moves the prospect to the next activity in the Campaign. Remove From Campaign: Removes this prospect from the campaign. Track the success of your Campaign using the Campaign Reporting Dashboard. From this Dashboard, you can see how many recipients are in each touch of the Campaign, and get insight into open, click and reply rates. By clicking into a specific Campaign, you can see a list of all prospects on a campaign and their status. For more information regarding Campaigns, check out our Campaigns Help Video and our Campaign FAQs. If you have additional questions, submit a request at help.yesware.com and we’ll get right back to you.